CAN YOU MAKE MY WEBSITE RANK HIGH? Search engine optimization has become essential for a successful website. We hear so many stories from clients who have been contacted by someone trying to sell them high rankings in the search engines. Whether you use our services or not, here's some free advice… don't waste your money! Unless you're dealing with someone you trust you're probably going to get taken for a ride. DON'T MAKE THE MISTAKE OF LETTING SOMEONE, OR SOME COMPANY, "BUZZWORD" THEIR WAY INTO YOUR POCKETS. What exactly do we mean by "buzzword their way into your pockets"? Well, the thinking behind it goes something like this. As long as I know more acronyms and catch phrases than you do, I can make you believe that I know what I'm talking about. That may sound like a funny thing to say, but it happens more than you might think. By the time you realize this on your own, you've spent (insert $$ here) and have seen no results. If you really want to know how good someone is at SEO there's a very simple test that anyone can perform. Ask for examples of proven results! No matter how many acronyms someone may throw around, or how intelligent they may sound, if they can't show you results, then you need to move on. 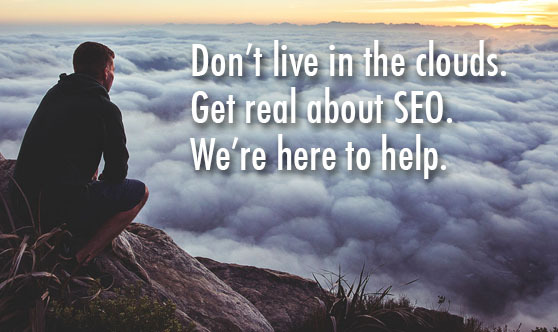 Another word of advice on picking a qualified SEO person/company. Don't let someone give you a persons name to search for as an example of their skills. Anyone can rank high for a search phrase that specific. This is especially true with real estate agents, because many agents use their name as a domain name. Ask for general search phrases that real people would use to find a product or service. Also, don't be fooled by listings in the side bar of search engines and the "ads" at the top. Those are paid links that anyone can buy those. That IS NOT search engine optimization. That is part of online marketing and there is a huge difference. There's nothing wrong with paid ads, but you need to understand the difference.